HomePick Me Up: Teachers Rock! Pick Me Up: Teachers Rock! Two birds with one stone again today…I like it when this happens! It’s National Teacher Appreciation Day, and the prompt for today is: What is the one word or phrase that immediately cheers you up when you hear it? The absolute first thing that popped into my head is: Teachers Rock! Totally, they do! Being a teacher is an awesome responsibility and I’m not so sure they get thanked often enough. I know that not every teacher is a “good” teacher, but honoring the profession of teaching is my intention in this post. Day in – day out, bar none, teaching is one of the toughest professions on earth. Infant and toddler child care teachers (yes, they are teachers) right up through college professors; every level of the educational food chain has distinct challenges. I myself, have taught from preschool through college level students and there is not one level that is “easier” than another, trust me. Today I want to thank TEACHERS: the ones that taught me, the ones I have taught, the ones who taught my grandchildren…and the ones who teach all of us every day, that to be a teacher is to touch the future. 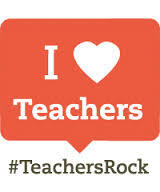 TEACHERS ROCK! It’s true they rock don’t they, I was a teacher too, but am wondering are we beating our own drum?